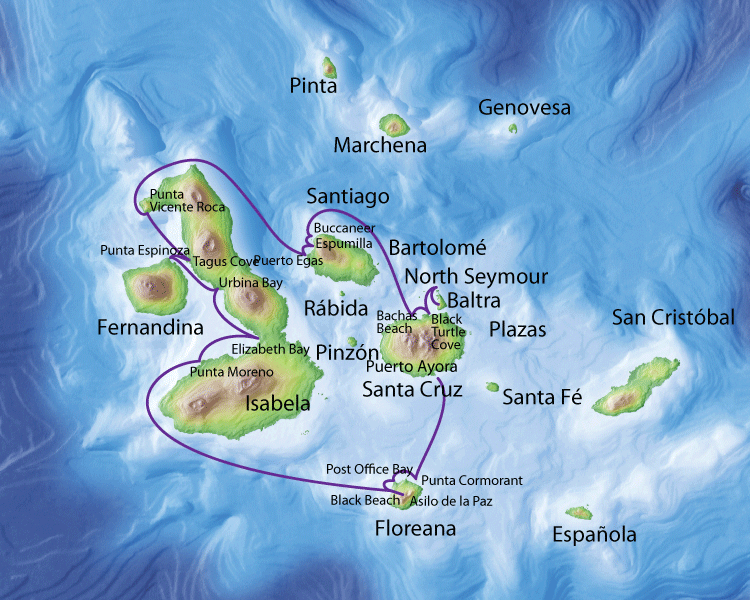 The Integrity cruises the western route of the Galapagos including Santa Cruz, Floreana, Isabela, Fernandina, Santiago, North Seymour and Baltra. PM — Charles Darwin Research Station and boarding yacht — Visit the Charles Darwin Research Station and Galápagos National Park headquarters to learn first hand of the conservation and research efforts in the islands. There, you’ll see several subspecies of adult tortoises, lots of hatchlings, and learn of the repatriation programs that are saving several subspecies of tortoises and iguanas from extinction. Later In the afternoon, you will board our yacht, Integrity, for dinner and set sail on your Island cruise. You will live aboard the yacht and spend as much time exploring the islands as park rules permit. Each night, you’ll travel on to the next destination. AM — Punta Cormorant & Champion Island — You’ll land on a green, olivine sand beach next to a large lagoon usually adorned with feeding flamingos and other water birds. A short hike through one of the more varied plant communities leads us to Flour Beach where sea turtles nest and small rays frolic in the surf. Enjoy snorkeling at Champion Island with curious, playful sea lions and hope to catch a glimpse of the rare Floreana Mockingbird..
PM — Post Office Bay, Asilo de la Paz, Black Beach — First you’ll stop at the wooden barrel that has served as a mariner’s “post office” since the 18th Century where you have the opportunity to continue the “postmaster” tradition. Then head into the Floreana Highlands to visit a collection of tortoises and learn about the island’s intriguing human history at Wittmer Caves and one of Galapagos’ only freshwater springs. Your day ends with a walk on Black Beach and a barbecue onboard Integrity. AM — Punta Moreno — Walk onto this young lava flow at the base of Cero Azul, past cacti and other early colonizing plants. This flow is dotted with numerous “oases” of brackish lagoons containing a wide variety of life, including flamingos, Paint-billed Crakes, White-cheeked Pintails, and Common Gallinules. PM — Elizabeth Bay — Silently float in skiffs through the narrow channels of this mangrove lagoon to see rays, Flightless Cormorants, penguins, pelicans, lava herons, sea turtles, sea lions, Blue-footed Boobies, many fish and other species that inhabit this vital zone. AM — Urbina Bay (Isabela) — This site is very unique. In 1954, volcanic activity caused a 6 km stretch of coastline to be uplifted 5 m in a matter of hours, stranding coral heads, and all sea life that couldn’t escape, more than a km away from the new shore. Walk among the skeletal coral garden, now home to lizards and mockingbirds. Urbina Bay is also home to large, colorful land iguanas. During certain times of the year you may encounter Alcedo tortoises which come down from the highlands to nest in the warm sands of Urbina Bay. PM — Punta Espinosa (Fernandina) — This peninsula is on the most pristine and youngest island of Galapagos. Fernandina is highly volcanically active with eruptions occurring frequently, the latest in 2008. Upon landing, you are met by an abundance of small, dark marine iguanas and brightly colored Sally Lightfoot Crabs. Walk out on a pahoehoe lava flow—younger than the one at Punta Moreno—past a few pioneering plants. Along the sandy shore you can see Flightless Cormorants, pelicans, and numerous, lounging sea lions. Sunsets are often stunning. AM — Tagus Cove — Pirates and whalers in the 19th Century using Tagus Cove for anchorage left their marks on the cliffs of this sunken caldera, a tradition of graffiti that continues to today. A short, steep hike passes Darwin Lake, which sits within a tuff cone and is filled with salt water. This site is an excellent place for viewing land birds, including Ground and Tree Finches, Galapagos Hawks, Yellow Warblers, Large-billed Flycatchers and even sometimes the Woodpecker Finch. A rare sighting of land iguanas is a treat. A dinghy ride or kayak along the cliffs provides views of geologic features, as well as penguins and other bird species. PM — Punta Vicente Roca — The large cave and cleaved tuft cone and caldera wall are impressive geological formations and provide a beautiful backdrop for nesting birds, including Blue-footed and Nazca Boobies, gulls, storm petrels, and Brown Noddy Terns. It also forms a calm gathering area for sea turtles. Along with sea turtles, snorkelers can see many species of colorful fish, penguins, sea lions, sea anemones, small jellyfish, and other sea life. AM — Puerto Egas — There are two separate trails here. The first meanders along the coast to the fur seal grottoes, a safe haven for the shy Galapagos Fur Seal amongst the crags and swimming inlets, and home to American Oystercatchers, marine iguanas and ubiquitous sea lions. The second, less-used trail heads inland to a lagoon at the Salt Mine Volcano where flamingos and other birds are found. PM — Espumilla Beach and Buccaneer Cove — Espumilla is a red-sand beach and a sea turtle nesting site, with an inland trail that passes a small lagoon and into the arid zone where it is possible to view many land birds in a beautiful landscape, including Galapagos Hawks. While snorkeling at Buccaneer Cove, you may see sea lions, fur seals, sea turtles, rays, sharks, pelagic fishes, and amazing underwater geologic formations. AM — Bachas Beach & Caleta Tortuga Negra — Enjoy a quiet and peaceful morning at Bachas’ fine, white beach. Two small lagoons just over the dunes sometimes host flamingos. “Bachas” comes from the remains of a barge which ran aground decades ago, leaving just a few rusty spines visible today. In Caleta Tortuga Negra enjoy a silent skiff ride to see sea turtles feed and mate in the calm waters, and three species of sharks, Spotted rays, egrets, and lava herons. Aboard we celebrate our last night together. PM — North Seymour — Snorkelers will enjoy their last underwater experience before we land on North Seymour, the flattest Island we’ll visit. The trail at North Seymour heads inland where we will see the largest colony of Magnificent Frigatebirds in Galapagos, Blue-footed Boobies, and occasionally land iguanas. Continue along the coast where you will have ample opportunity to observe sea lions and marine iguanas as we enjoy your final Island sunset. AM — Have breakfast on board Integrity, then disembark at Baltra Island.